Today's first post is my challenge card that I made for the Kenny K Challenge this week! The challenge was to make a card with your favorite ICE CREAM COLORS! How yummy is this? This card has taken me TWO DAYS...yes...TWO DAYS to finish - LOL! I colored my image with my Spectrum Noir Alcohol Ink Markers and I absolutely LOVE how it turned out. I am still a newbie at coloring with markers so I kinda impressed myself with how my little Troublemaker turned out! LOL! 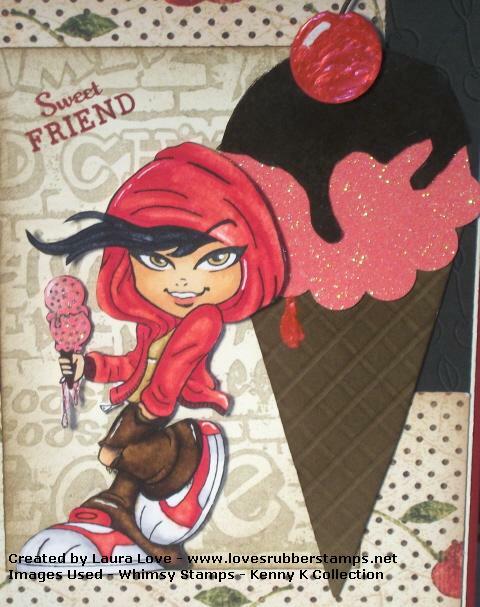 My favorite ice cream of Bordeaux Chocolate Cherry Inspired my card! It is kind of hard to see but my black background paper has black embossed raised cherries. This is a retired Stampin Up! design. The reason this card took me TWO DAYS to finish is because of my other background paper I used! It is called Bees Knees and it is a retired Graphic 45 pattern that was my FAVORITE FAVORITE paper and this was my LAST piece...so I didn't want to use it... I wanted to HOARD it - LOL! So I searched and searched and searched online and I found some that a store had left in stock... 12 sheets! So I snagged them all up...and then I could use my paper - LOL :) So if you spot some...let me know... I will buy it - LOL! My ice cream cone being the tall vertical panel :) When I saw Holly use this sketch the other day I fell in love with it and wanted to try it out myself. 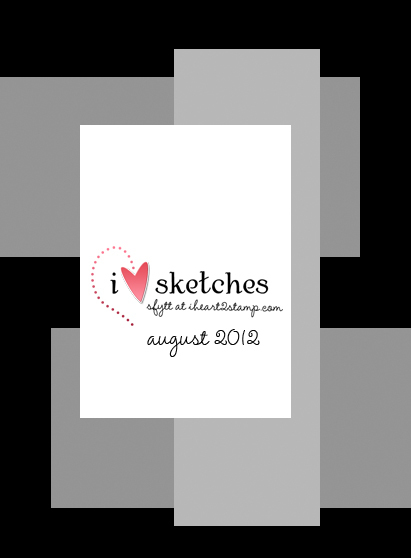 That is the hardest part of card-making for me - the lay outs so I love when awesome sketches come along - LOL! 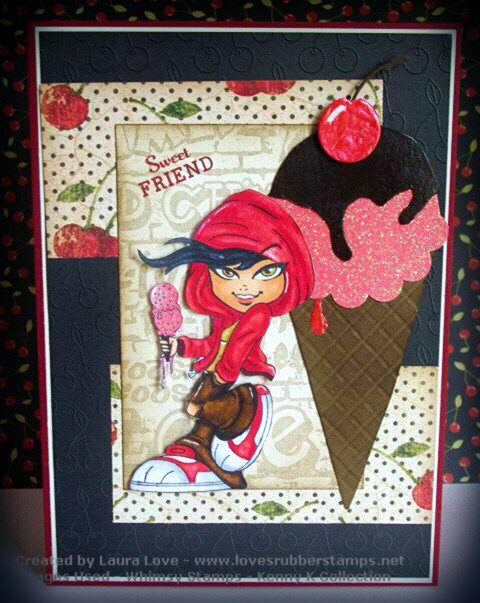 The images I used on this card are - Troublemaker from the KennyK Collection - Whimsy Stamps, My background for the girl is the Street Art Background from the Raindrop Echo Collection - Whimsy Stamps, and my "Sweet Friend" Sentiment is from the Flourishes Stamp Set - Apple of My Eye. Thanks so much for stopping by and talking a peek! I plan on working on preorders in the store and making at least one more challenge card for today...hopefully two because I have them all planned just have to get the time to bust them out :) If I do I will post them later on today! Great card, fab ice-cream & your colouring is perfect! Thank you for sharing with us at MAWTT & Divas this week, good luck! This is so gorgeous! The colours, the layers...Everything! Good luck on Craft Your Passion! Thanks for joining us at MAWTT for my 'Summer' theme and Good Luck in the Challenge! Love how you used this sketch! And you rocked the ice cream color challenge. Good for you for breaking into your hoard! lol. Had to laugh, I am the same way. Your coloring is fabulous. Super super cute. 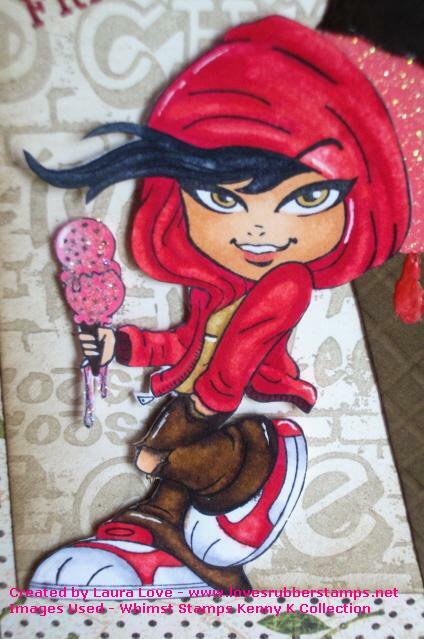 Wow- What a great card for a girl! Love the image and colors you have chosen! Thanks for sharing it with us at Send a Smile 4 Kids and hope to see you again soon! Fabulous card! This is so fun. Thanks for joining our CropStop Fruitalicious Challenge. Wow if this is a first go at colouring you did a fantastic job. Love the card, great image and the large ice cream works perfectly. Thanks for joining us this week at Moving Along With The Times. A fun card! I love the giant ice cream cone! Thanks for sharing it with us at MTME pretty palette! wow what a wonderful card and your colouring is fantastic. hui so nice!!! Great card. Thank you for joining us at Divas. What a great, sassy card! Thank you for joining this week's Crop Stop Challenge! Now I want an ice cream cone! This is gorgoeous! Your coloring is beautiful! I hate giving cards that I love away too! Great idea to put it in your smash book! Thanks for playing our Pretty Palette challenge! WOW!!! fabulous design and gorgeous use of our color combo!! thanks for playing along with us at MTME! !